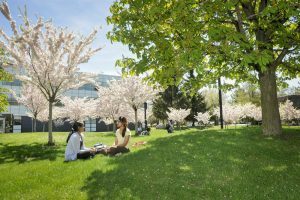 Students enjoy UTSC’s cherry orchard, part of the South Campus Common landscapes. Who are we at UTSC Philosophy? We are a group of dedicated researchers and teachers. From year to year, our collective publication record is frequently the best and always nearly so among the university’s three philosophy departments. At the same time, we are committed to providing a sound philosophical education to students from a range of constituencies: from those seeking initial exposure either to philosophy in general or to philosophical perspectives on a more specific issue; to those hoping to accumulate the intellectual tools and expanded perspective that follow on a more sustained exposure to philosophy; to those who want pre-professional training on the road to an MA or PhD in philosophy. Our B-level courses are medium-sized lecture classes covering one of the major areas in philosophy: for example theory of knowledge, ancient philosophy, or political philosophy. Our C-level courses are smaller and more discussion-based; here we cover significant sub-areas of these major areas in more detail: rather than a general course on theory of knowledge, a C-level course might discuss skepticism; rather than a general course on ancient philosophy, a C-level course might discuss Plato. Our department offers concentrations at three levels of intensity: minor, major, and specialist programs. Our specialist program is for the student with a very high level of dedication to philosophy. Specialists take 24 half-courses, which works out in practice to between three and four in a typical semester. The specialist can be confident of acquiring a thorough and deep exposure to a great many areas of philosophy. Our majors take 14 half-courses, which works out in practice to two or three in a typical semester. This leaves room for a major in a second field. A double-major in philosophy and, for example, physics, English, math, economics, neuroscience, or linguistics can provide synergies that are valuable in many ways: one’s philosophical training enables one to look more deeply at the foundations of one’s other field; one’s training in the other field provides one with valuable data against which to formulate or assess philosophical theories. Specialists and majors take a high percentage of their courses in smaller, more intimate C- and D-level courses, where papers are marked intensively by professors. Our specialists and majors have a very high level of esprit de corps, meeting regularly through the Association of Philosophy Students for debates, talks, movie nights, and other social events, and to put on an annual international undergraduate conference. Finally, the minor in philosophy requires eight half-courses: one or two in a typical semester. This program is for the student who wishes to do more with philosophy than get their feet wet but who does not have room for our major program, or for the student who discovers philosophy late in the undergraduate career but seeks an intensive exposure as a ‘capstone’ experience. A minor in philosophy can serve as a distinguishing credential for one who pursues a career outside of philosophy, or as preparation for MA study in philosophy. Our department was born on July 1, 2010. Prior to this, our faculty were members of the Department of Humanities; this arrangement had been in place since the founding of UTSC. Our department hosts a mix of veteran members and more recent hires: some of us have been at UTSC since the 1980s or earlier, though most of us moved here after 2002. The UTSC philosophers are members of the tri-campus Graduate Department of Philosophy. The graduate department is ranked among the top 15 philosophy departments in North America, and is among the top 10 departments in public institutions in the English-speaking world. Our department has an excellent recent placement record for PhD programs in philosophy. Since 2008, UTSC philosophy concentrators have matriculated in PhD programs at Rutgers University (#2 philosophy program globally), Cornell University (#17 in the USA), and the University of Western Ontario (#2 in Canada).